Nice to see new and familiar faces at our first orienteering event of the year. This was the 6th in the 2018/19 Autumn/Winter series and followed the 5 colour coded course format we have adopted for the Ecko club league. Fearnoch is great for catering for the range of abilities and interests in the club. Not so good, compared to our other mapped areas, for technical orienteering challenge. However, the planner enjoyed squeezing in the full range of colour coded courses into what is available. More and more of the forest is opening up as it matures and some more detail was added to the map for this event. There is a lot more of it we could map if and when we get the capacity to do so. Meantime, it allows a pleasant romp in the winter sun without too much bog trotting or spruce whipping. Huge apologies from the planner for mixing up controls 108 and 127 and well done to all those who persevered and overcame their self doubt to punch the correct control anyway. Allowance has been made for those that didn't punch because of this discrepancy. The planner realises that he has reached that time in life where he needs to contemplate wearing glasses in poorly lit forests..or perhaps it was just a stupid mistake and he should take time to double check every control he puts out in future! It was good to have some visitors from further afield than our usual catchment. Nice to see Jura, home from Glasgow Uni for the weekend and clearly in good shape to beat those attempting the blue course. Also nice to see Rhona stopping off to see us on her way home to Inverness too. George and Mo proved they were well capable of navigating off track to find the controls in the forest on the orange course. Also two strong performances from Krishnan and Liza on yellow. Some more runs like that and they will all soon be stepping up a colour level. Special thanks to Alan for printing maps, downloading and preparing results and for helping to collect controls. Events like this are a team effort. Anyone who would like to help out at future events please let us know. There are always plenty of things to do and the more of us that are involved the more orienteering activities we can put on. The sixth event of the autumn/winter series, including this year's league. 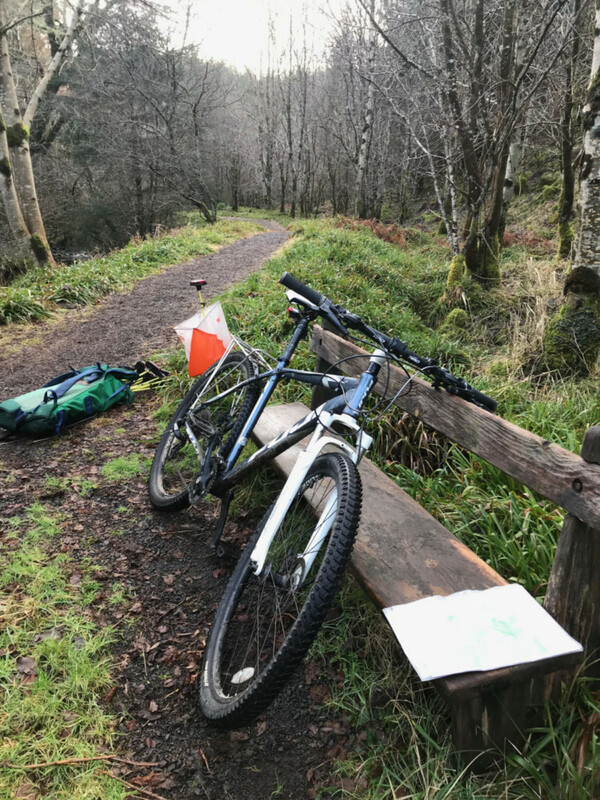 Fearnoch was originally mapped for its path and road network suited for courses up to technical difficulty 3 (including Long Orange) and bike-O. Club members have since added in some detail to the more open wooded areas and courses visit some of these areas. Several areas have been felled in recent years or suffer from windblow. Courses avoid the areas most affected by brashings or fallen trees but those on the more technically difficult courses should choose their route choices carefully to avoid the dark green and hatched green areas. Registration opens at 10:30. Starts from 11:00 to 12:00. Courses close at 1400hrs. TO BOOK A MAP FOR EVERYONE IN YOUR PARTY. This helps us print sufficient maps for everyone. Dogs allowed but please note this is a popular destination for dog walkers so please be respectful to other forest users. Nearest public toilets are at Taynuilt. Iris Macmillan will be offering a home baking stall to raise funds to compete in the World Schools Orienteering Championships in Estonia this year. So please support her cause by buying and eating her delicious cakes!